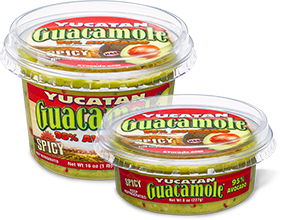 With a savory mix of mild garlic seasoning and packed with golden-ripe Hass avocados, Yucatan Mild Guacamole is perfect for snacking with your favorite chips, as a dip with a fresh vegetable tray, or as a delicious addition to favorites like fajitas, tacos, sandwiches, salads, and more. 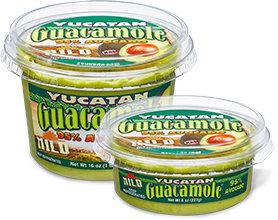 With a savory mix of mild garlic seasoning and packed with golden-ripe Hass avocados, Yucatan Mild Guacamole is perfect for snacking with your favorite chips, as a dip with a fresh vegetable tray, or as a delicious addition to favorites like fajitas, tacos, sandwiches, salads, and more. Gluten-free and Kosher. Available in 8-ounce and 16-ounce tubs. 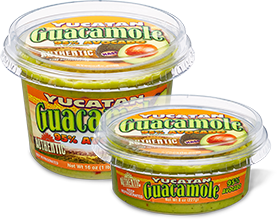 Hass Avocado, Salt, Sugar, Onion, Garlic Powder, Ascorbic Acid (to preserve freshness), Citric Acid (to preserve freshness), Xanthan Gum. Avocados boost levels of HDL, commonly called the “good cholesterol”.